Creoles are new languages: we know when they emerged. Documentary sources of their early stages are therefore crucial for finding out how they emerged. However, the authenticity of these sources should be looked at critically. Virgin Islands Dutch Creole did not exist before 1672 and was mentioned for the first time in 1736. In the following decades Moravian and Lutheran missionaries started a tradition of translating Christian texts into this new language of the Danish Antilles (US Virgin Islands). On the surface of it, these texts look bookish, influenced by missionary jargon, Dutch-like, and perhaps even artificial. 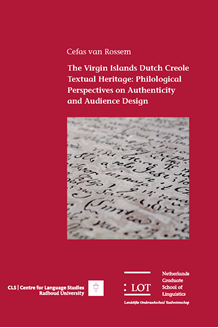 This dissertation studies the authenticity of Virgin Islands Dutch Creole texts from a philological perspective. First, it focusses on early influence of the first colonists, on the appearance of uncertainties and inconsistencies in early texts and on metalinguistic information. An important starting point is the analysis of the Moravian Mission’s speakers community by using Bell’s Audience Design Model. Second, five case studies, using the digital Clarin-NEHOL-corpus, present insight into the links of the writers/translators with their audience of Creole speakers, their background, and religious traditions. The third part of this work is dedicated to early twentieth century fieldwork in which spoken Creole was recorded. Metalinguistic comments and study of the fieldwork practices show that the study of this material also benefits from a philological approach.